A proven understanding of the key elements, interdependencies and characteristics of a concise, yet comprehensive, operating plan, a competitive strategy, a sales operations management process, a call plan, etc. The steps and tools necessary to enable an executive level management team to effectively and efficiently build consensus on, and commitment to, quality answers to critical business issues. A broad range of facilitation skills developed with, and complementary to, the process expertise – the right question at the right time, in combination with the process and tools, for the optimal result. Success across a range of participants, and combinations of participants, from individual contributor to the most senior executive, from large to small company, from public to private sector, from domestic to international/cross-culture and from the most enthusiastic, cooperative “seeker of truth” to the most skeptical, cynical “detector of contradiction”. Experience dealing with the widest array of business challenges across a diverse range of industries, markets and international business environments. © All Rights Reserved. 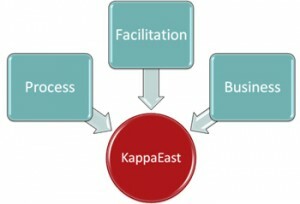 KappaEast Management Consulting, Inc. | Designed and maintained by HCP Associates.